A gritty, realistic cop drama that will grab your attention and read you your rights. All 10 episodes of Bosch arrive on Amazon Prime Instant Video on Friday 13th February. Fresh from celebrating the Golden Globe wins of Transparent, Amazon Studios are expanding their catalogue with a 10-part adaptation of Michael Connelly’s detective novels, Bosch. Judging by the opening episodes, it could prove to be another success. 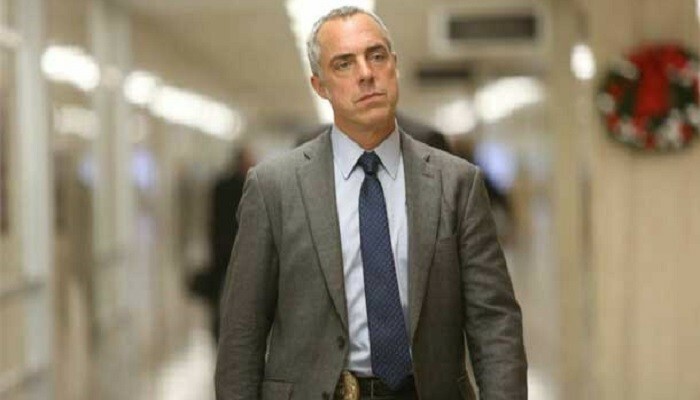 Harry Bosch (Titus Welliver) has his flaws, most of which are dragged up for the jury and the media to feast on while he stands trial for the murder of a serial killer. He is accused of planting a weapon on the body after breaking standard police protocol to pursue the suspect. 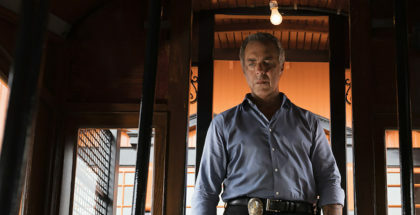 Already notorious from a movie that was based on one of his cases, Bosch has his enemies, possibly even some within the department who want to see him taken down. 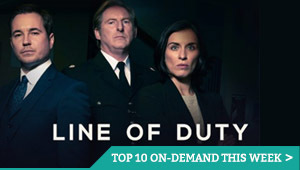 The first four episodes entwine the trial with an investigation into the brutal murder of a 13 year old. When bones are found in the woodlands, they are discovered to be that of a badly beaten teenage boy, buried in a shallow grave 20 years ago. Each episode builds the plot, dropping new clues and creating more tension as the case evolves. It’s refreshing to watch a detective drama where it isn’t a new case every episode but one that grows over the series (Season 1 is based on three books: City of Bones, The Concrete Blonde and Echo Park). Parts of the story have been modernised from the novels, all overseen by Connelly himself. Elements of Bosch’s back-story come out during the trial, from his Gulf War experience to the suggestion that his mother may have motivated him to become a cop. Having seen war alone is enough to scar anyone and there is something deeper that lies behind Welliver’s eyes. When the coroner explains the brutality that the teenager suffered, beaten daily, Bosch has to take a moment alone, dousing his face in cold water, as images of pain and suffering fill his head. Later, he begins to call the victim by his first name, unheard of in the precinct, begging the question of what happened to him to relate so heavily to the case. While Bosch is an entertaining drama, it excels in its sense of realism. It’s beautifully shot and encompasses not only the city of Los Angeles but its suburbs and Hollywood Hills too, giving us a real sense of expanse. The show doesn’t give us shootouts, car chases or visceral murders, but the grey walls of the precinct and courtroom, which emphasise Bosch’s weary attitude of a veteran cop who has seen it all. It feels nostalgic, its jazz score almost painting the fedoras on the characters’ heads. There have been many great detective shows set in LA and Bosch looks to continue that trend, thanks, in part, to its perfect casting. Connelly approved of Welliver and the actor, who has mostly been resigned to supporting roles in shows such as Sons of Anarchy and Lost, revels in taking the lead. 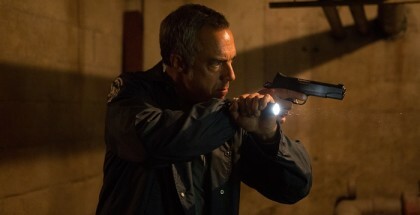 He embodies the role; in both appearance and mannerisms, Welliver looks like a detective after years of murder and tragedy have weathered away at him. His attitude towards the media and his colleagues blend excellently with each other and with the setting. Casting is one thing Bosch does very well. His co-workers and bosses all fit the bill too, but it is serial killer Raynard Waits (Jason Gedrick) who stands tallest. Both Gedrick and Welliver play off each other well and Episode 4 leaves us knowing the pair will get to see more of each other. So convincing is the performance, Waits’ protests of innocence immediately engage, making you believe that what he says might be true. Where casting lets the series down is the love interest, Julia Brash (Annie Wesching), a rookie cop who gets involved with Bosch. They haven’t spent a great deal of screen time together, but when they have, it’s been less than electric. 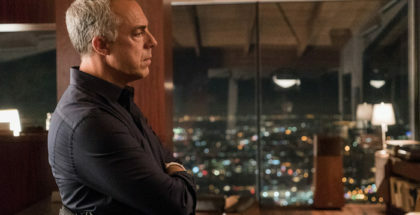 The story is open to have this relationship develop further, though, and Bosch is breaking the rules once again by dating a co-worker, so it’s almost inevitable that there will be more trouble for the detective. But the show’s strongest weapon may be Connelly himself. The best-selling author is on board as executive producer, working with Eric Overmyer, who brings his years of experience working on Law & Order, The Wire and Treme. In the 90s, Connelly sold the rights to Bosch to Paramount Pictures but after three script attempts, the project was put on hold. When the rights expired in 2012, Connelly looked for a new partner to bring Bosch to life and found that in Amazon Studios. He got to be hands-on with the project and having the author’s input and vision could be what makes Bosch a success. This is a gritty, realistic cop drama that will grab your attention and read you your rights. Bosch is available to watch online exclusively on Amazon Prime Instant Video, as part of a £5.99 monthly subscription. All 10 episodes will be released on Friday 13th February. You can watch the pilot episode now for free, without an Amazon account.